I'll be sending this one off to have the tenon replaced, stem refurbed(if possible), and given a thorough cleaning. I don't want my sausage fingers messing anything up. Mostly just wanted to share, but if anyone has insights or similar pipes please share. I would agree with the hallmark being London, date code u, 1915. Nice old Loewe. Yes, u is my best guess. Nice piece! I agree with it being a "U" and therefore 1915. 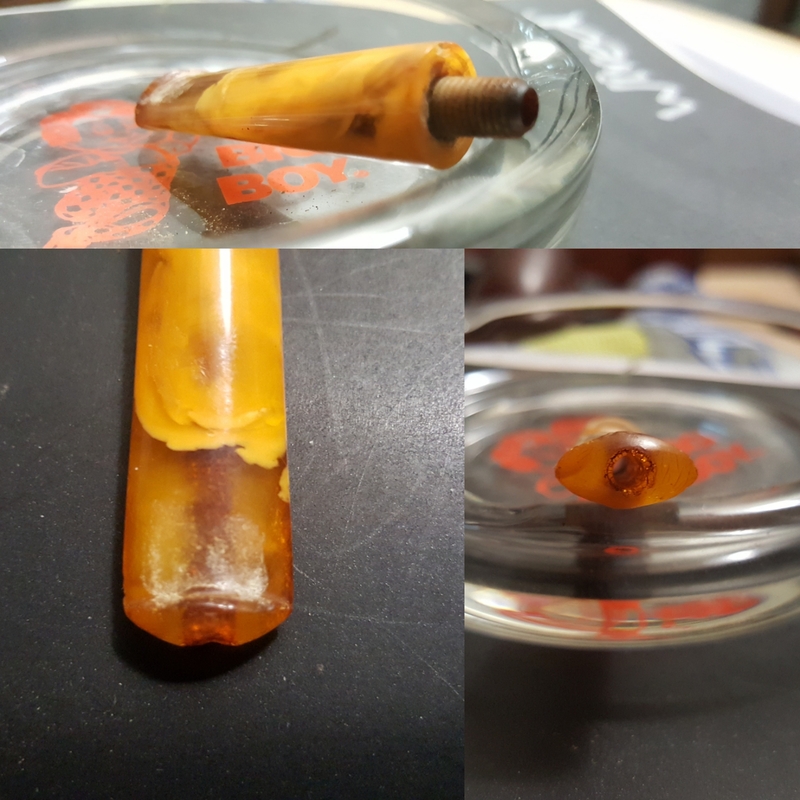 The stem looks like amber to me. 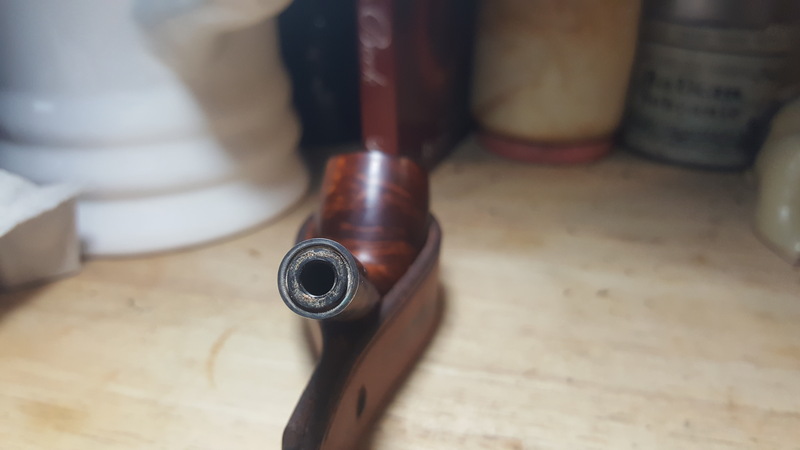 What kind of tenon was used with this pipe? Looks to be the typical bone screw tenon. Beautiful Loewe you have there, Brian. Congrats! The stem is the original amber. Thanks for sharing the picture. Possibly a bone tenon, hard to tell. This is fairly late in the game for screw-in tenon on briar pipes. Barling had switched to vulcanite friction tenons on all stems, both vulcanite and amber, years before. If you don't mind, could I see a photo of the mortise without the stem attached? Lovely- but the band, a shame. Cleaned with a wire brush? I will post one up when I get back home.. had to go run some errands. Nice pipe. I own 2 Loewe and they are fantastic burners. Thanks for that latest pic. It looks to me like a stuck tenon whose connecting screw has become detached. Of course, I could be wrong and you can tell me if the face of the mortise I'm looking at is wood. A stuck tenon can be freed up, but amber is very fragile, so getting that tenon out needs to be done with great care. Ya know, I never considered that. I just don't have much experience with screw tenons.. how they are intended to operate. I've seen pictures from Mike Myers of similar pipes (Loewes too). I just may contact him and see what he thinks should be done. Ash, this is my 4th in a fairly short period of time. The first one I got was so impressive to me I just had to get more. ...and now that I REALLY look at the mortise.. I don't think the face of the mortise is wood. I think it's..vulcanite or similar. So the screw attached to the stem actually screws in to a solid tenon that is meant to push into the mortise? And that piece is stuck..
Now you know why I asked to see a photo of the mortise. It's almost certainly vulcanite. Barling pioneered this kind of construction using a vulcanite tenon connected to the amber stem by means of a screw that was cemented into place. Vulcanite is both softer and tougher than amber. Sometimes the cement gets brittle and fails, allowing the connector to unscrew. What needs to be done is to drip alcohol into the crevice between the tenon and the mortise to soften up the crud that is holding the tenon stuck. To introduce the alcohol I used a small syringe to lay in a few drops at a time, letting it penetrate. Took about 35 minutes. Then I gently unscrewed the tenon from the mortise, rotating it in the same direction that tightens the connecting screw. With an amber stem you have to have little to no resistance when turning the stem, or the amber will crack. If you are unwilling to take the chance, a qualified repairman should be able to remove the tenon without damaging it. I have a dropper..i have alcohol... tempting. Maybe tomorrow. Appreciate the insights, ye olde bard. Brian, send it to Ric at Briarville....he's a wizard at that sort of problem. A 1917 Bewlay should be back any day now from Ric. Looks to have done a terrific job.